It is easy to answer the question of how Brett M. Kavanaugh will be received by his fellow justices at the Supreme Court after a historically bitter and tumultuous confirmation battle: as one of nine equals, with whom they will work for the rest of their careers. The tougher question is how months of partisan warfare will affect the court’s image. Can the justices convince the public that their solidified 5-to-4 split — with conservative Republican-nominated justices on one side and liberal Democratic-appointed justices on the other — is any different from the 50-to-48 vote across the street in Congress that elevated Kavanaugh? Kavanaugh was at the Supreme Court Sunday with his law clerks — he has made good on his promise at the hearings to become the first justice to hire women for all four positions — preparing for his Tuesday debut. But his new colleagues had already moved to paper over the damage. 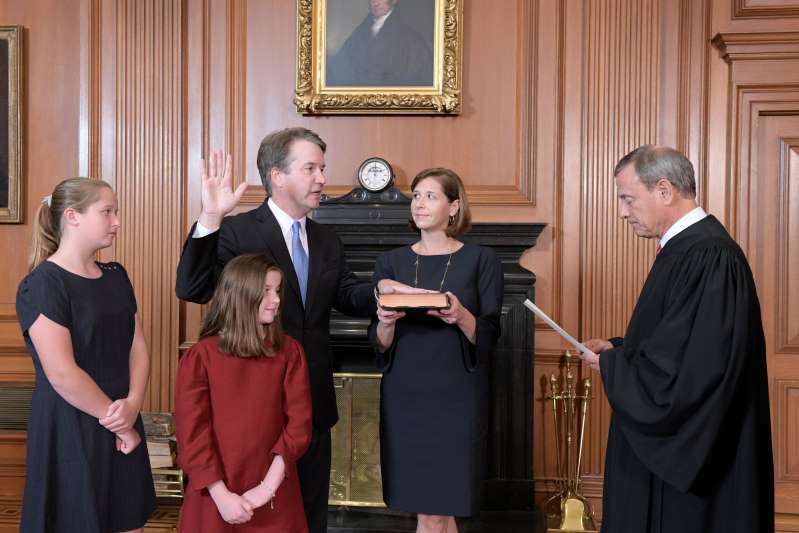 Liberal justices Ruth Bader Ginsburg and Elena Kagan joined conservatives Clarence Thomas and Samuel A. Alito Jr. at Kavanaugh’s hastily called private swearing-in ceremony Saturday night to witness Chief Justice John G. Roberts Jr. administer the oath. That some colleagues were missing was a matter of scheduling, not protest. The justices can resemble a family in that way: They can harshly criticize each other — at least in the confined spaces of legal opinions — but form a solid perimeter when the attacks come from outside the Marble Palace. Justice Sonia Sotomayor reflected that even before Kavanaugh was confirmed. “We have to rise above partisanship in our personal relationships,” Sotomayor said Friday in a joint appearance with Kagan at their alma mater, Princeton University. This would be especially true for liberal justices, of which Sotomayor and Kagan are two, who could be presumed to be most aggrieved by Kavanaugh’s nomination and confirmation. They simply can’t prevail on an issue without convincing one of the conservatives to join their side. Thomas has gone from wearing a bulletproof vest, as he recounted in his memoir, to seeing his once idiosyncratic legal views embraced by new members of the court. His clerks have risen to prominent positions in the Trump administration and choice jobs on the nation’s appeals courts. His strained relationship with his law school alma mater, Yale, has been repaired in recent years, largely because of efforts by the school’s liberal faculty and deans. The exception to the bonhomie for Kavanaugh came from retired Justice John Paul Stevens. The 98-year-old Stevens took the highly unusual step of saying he thought Kavanaugh’s angry and emotional testimony at a hearing confronting allegations of a teenage sexual assault were enough to disqualify the judge from the Supreme Court. He also somewhat tartly dismissed comparisons of Kavanaugh to Thomas, saying he had served — and disagreed with — Thomas for years. There’s no evidence that current members of the court feel that way. Kavanaugh has been a prominent member of the federal judiciary, with 12 years on the U.S. Court of Appeals for the D.C. Circuit and ties to each member of the court. He served with Roberts in the George W. Bush administration, and championed Roberts’s elevation to the Supreme Court. Kagan hired him to teach a class when she was dean of Harvard Law School. Fellow Trump nominee Neil M. Gorsuch was also a fellow classmate at Georgetown Prep, two years junior. Kavanaugh’s clerks are routinely hired at the Supreme Court. But Kavanaugh faces some obstacles even Thomas did not. Thomas’s hearings “didn’t manage to get quite as ugly as this one or get quite as partisan as this one,” said Barry Friedman, a law professor at New York University who writes about the court and public opinion. Thomas, nominated by President George H.W. Bush, was approved by a Democratic-controlled Senate, and public opinion polls showed voters favored his nomination, even after charges of sexual harassment, which he denied. Polls did not show Kavanaugh with majority support, and his vote was almost exclusively along party lines. Some House Democrats have vowed impeachment proceedings for what they consider his untruthfulness during the Senate hearings. Documents from his service in the Bush White House, which Senate Republicans said were not relevant to Kavanaugh’s confirmation, will become public at some point. Justices usually recuse from cases when they have a conflict involving family or finances, and make the decision for themselves. Justice Ruth Bader Ginsburg has not recused herself from cases involving the Trump administration after making derogatory comments about Trump before the election, which she said she should not have made. Michael McConnell, a former federal appeals court judge and head of Stanford’s Constitutional Law Center, said he did not think Kavanaugh had anything to apologize for. But McConnell’s colleague Rhode said that if Kavanaugh does not recuse in some cases, it will only highlight the system of justices making such decisions on their own. The court’s docket, at this point, does not contain those kinds of issues. But the unconstitutionality of partisan gerrymandering, which carries major implications for the political parties, will be back. Questions of executive power are inevitable. Sometimes the court has control over the issues it hears, and sometimes not. The discretionary part of the docket will be an important thing to monitor, said Richard Lazarus, a Harvard law professor who closely watches the court. “One bellwether might be the nature of the legal issues the justices accept for review in the near future,” he said. Speculation has been that the newly energized right side of the court might want to take cases that push the envelope, now that the more moderate Justice Anthony M. Kennedy has been replaced by conservative Kavanaugh, Lazarus said. “Perhaps now those four, including Kavanaugh, might decide it is prudent for the court, for the good of the nation, to reduce the court’s profile,” he said.